I don't think I ever fully explained how I set up my fasting menus and notebook, so last weekend as I was making sure everything was in order for shopping, I thought it would be a good time to share how I organize and update my menu. For some, the idea of a set menu is stressful, boring or just a little too OCD (words some of my friends would probably use for me as well :). I have found them to be helpful, especially during seasons of fasting. There are seasons when I just cook what I want, usually in the summer months when creativity is stretched by not knowing what will be ready to pick in the garden, or what vegetables will arrive in my CSA box that week! Those are the times when I enjoy the fun of cooking as creating. During a fast, we eat to live, to sustain, and hopefully to train our passions, so it just makes sense for me to remove the stress of daily decision making with a set menu. There are many ways to do that. I have friends who have a menu that rotates through a 3 week cycle for Lent, others who eat the same thing every week; so there can be flexibility within a menu plan. For Lent, I have a set framework of breakfast and lunch dishes, with dinner meals I alternate. In setting up my menu, I selected dishes I knew most of my family enjoyed (there is always one who likes to throw a wrench in things - she eats lots of peanut butter and jelly sandwiches :)﻿. I scheduled them by choosing easier or make ahead dishes on nights we have services, and planned our favorites on the nights I know my husband can usually get home in time for dinner. I picked a few special dishes that are more labor intensive for the weekend when fasting guidelines relax some and I have more time to enjoy cooking. Once the menu was set, I typed it out and created a weekly grocery list. If there are large amounts of non-perishables, I often do one large grocery trip for those before the fast, then eliminate them from my shopping list. That allows me to cut down on the time I spend in the store. Since most of the items I am shopping for will be found in produce and the bakery, I can avoid shopping the rest of the store - a bonus when you are dragging four kids through the store, and they are drooling over the donuts, sausage and cheese! Finally, when I have my menu and grocery list printed, I select the recipes for all of the dishes I will be cooking during that season. I have a small 3-ring binder just for fasting periods which has tabs marked with the days of the week. Using page protectors, I file the recipes behind the appropriate tabs. 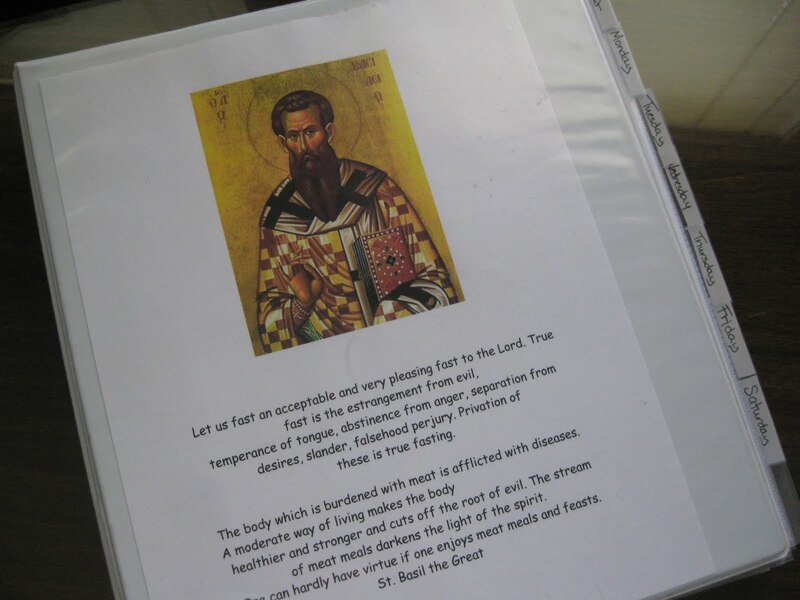 I file the menu and copies of the grocery list at the front of the binder, and keep a small selection of fasting recipes in the back such as a St. Phanourios Cake recipe. I really like having everything in one place - my notebook stays in the kitchen, and I don't find myself having to hunt down a recipe or figure out what to fix! It was a big project the first time I put a menu together, and I spent several hours searching for recipes and making a plan, but the payoff now is huge. Each new season, I look back over the menu. I might change a recipe or two, but rarely more than that. I can have everything ready in my binder in very little time, and I have the confidence that I will not be caught unprepared. Of course, I also realize that life happens, and there are times when the plans are ignored or shuffled around, but simply having a plan allows me to be more flexible within the framework of the plan. Whether you have a set menu or not, a little planning ahead can certainly make each week's cooking a little less stressful. If you work away from home during the day, just knowing what you will be fixing, and knowing that you have all of the ingredients can make the evening meal less of a burden as well, not to mention save money since you are far less likely to grab take out or decide to eat dinner out. I set up my menu plan very similarly, but I do not keep everything in a binder. Many of my recipes come from cookbooks or recipe cards, so that wouldn't work for me. Instead, I just write the location of the recipe after the name in my menu spreadsheet. I have not kept to my menu plan perfectly, but it helps to at the very least have a list of recipes that I have all of the ingredients for in the house. And then on special days (feast days, namesdays), I can stick to my menu plan. thanks for sharing what you do as well Michelle! We certainly don't stick to it perfectly, that is life, but it is nice to have it there. And as for recipes in books - most of these came from books, magazines or websites, I have just come to the point where it is worth it to type the recipe out so it is in a format that is easy to share (or reprint when I can't find it!) It has also allowed me to get rid of some of the cookbooks that I really never used other than that one or two recipes. Hope you are doing well!